TELEVISION gardening expert Charlie Dimmock visited Meadowlands Residential Park in Addlestone to present the winners of the Haulfryn in Bloom award with prizes for their beautiful garden. 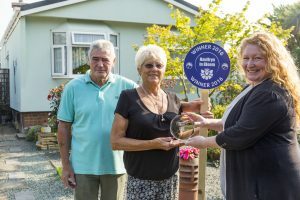 Haulfryn were looking for the best kept gardens across the South of England at their 14 residential parks, and the garden that truly stood out was at Meadowlands Park. Kevin and Mary Cullinan beat more than 150 entrants to scoop the best garden of all and received the inaugural Haulfryn in Bloom trophy and £500 of gardening vouchers. The former Ground Force star was warmly welcomed by the winning couple and the Residents Association at Meadowlands Park and chatted with her over champagne, tea and nibbles at the site beside the River Bourne.